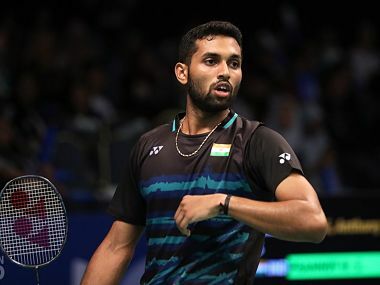 Jakarta: Giant-killer HS Prannoy played his heart out but eventually ran out of steam against Japanese Kazumasa Sakai to go down narrowly in the semi-finals of the Indonesia Super Series Premier badminton tournament here today. The World No. 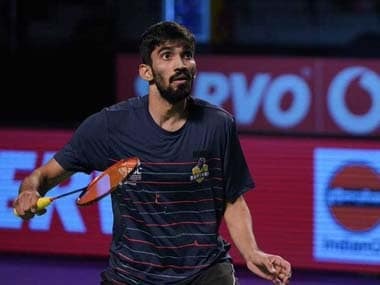 25, who had shocked Olympic silver-medalist Lee Chong Wei and gold-medalist Chen Long in the last two days, got to the match point five times but he could not convert to eventually go down 21-17, 26-28, 18-21 in a 77 -minute men's singles match. Prannoy, who had lost to the same opponent during the 2013 edition, mostly matched Sakai stroke for stroke but failed to complete the rallies. The Japanese, a bundle of energy, showed better control over the shuttle to emerge victorious. In the first game, Prannoy and Sakai were locked 2-2 early on but the Indian soon moved ahead to first make it 4-2 before entering the break with a healthy 11-6 lead. He moved to a 19-15 lead and soon grabbed the game point. Prannoy hit wide and then sent the shuttle out as the Japanese saved two game points but his smash went to the nets next as Prannoy earned the bragging rights. The second game was a roller-coaster ride as Sakai opened up a 5-1 lead after dominating the rallies early on. The Indian narrowed the gap to 4-5 with the help of his smashes. But he was finding it difficult to control the shuttle and a lot of his shots went wide as Sakai moved to 11-5 at the interval when Prannoy's return went to the nets. The duo engaged in long rallies but Prannoy couldn't close them, unforced errors being the culprit. Prannoy produced some scintillating down-the-line smashes and kept breathing down his rival's neck at 15-17 and soon clawed back at 18-18. Sakai hit the shuttle long next as the Indian moved to 19-18 and he grabbed his first match point at 20-19 due to a lucky net chord point. The duo faltered at the net once each as it was 21-20. Sakai then produced a superb down-the-line smash to once again claw back and grabbed a game point when Prannoy dived only to send his rival's return out of the court. At 21-22, another towering cross-court smash brought Prannoy at level par but he failed to reach for a shot at the forecourt next. Fortunes continued to fluctuate as Prannoy failed to negotiate another return from Sakai as the lead finally swung back to the Japanese at 27-26 and he sealed it this time when Prannoy's miscued smash went to the net. In the third game, Sakai moved to a 6-4 lead early on and soon had a four-point advantage. Lagging 5-9, Prannoy tried to change the pace of the rallies. He narrowed it to 7-9 before Sakai headed into the break with a slender 11-9 lead. After the change of sides, Sakai extended his lead to 15 -11. Errors continued from Prannoy but he managed to narrow the margin to 17-18. But eventually, it was the Japanese who had the last laugh.